Psoriasis is one of the major skin diseases caused by internal, immunological factors where the ski gets severely affected. Psoriasis is known to be a long standing autoimmune disease which is characterized by patches of abnormal scaling and inflamed skin anywhere on the body. These skin scaly, red, inflamed, itchy patches range from small, medium to large sized patches. It affects about 1-2 % of the general population and males and females are equally affected by it. It can trigger at any age but it is commonly seen between the middle aged populations. Children may also present with psoriasis. Psoriasis majorly affects the skin but also affects other body parts like the nails, joints, scalp and private parts. It is infamous as a winter disease amongst the laymen, since it usually gets worse in the winter season. However, the patients may suffer with psoriasis in any weather or round the year as well. Psoriasis presents with ugly looking lesions which can become a reason for embarrassment in individuals suffering from it. Individuals suffering from extensive lesions may shy away from the crowd and restrict themselves to their homes resulting into social phobia and depression. But counselling the patients about the non-contagious nature of their disease can regain their confidence and help them lead a better life. Psoriasis is a disease of the immune system which manifests on the skin. It is often caused by more than one factor. Fundamentally, immunological and genetic factors are there in the background which might get triggered by stress, hormones, chemicals, drugs, or climate. Sometimes it may appear or worsen in an unexplained manner. 1. 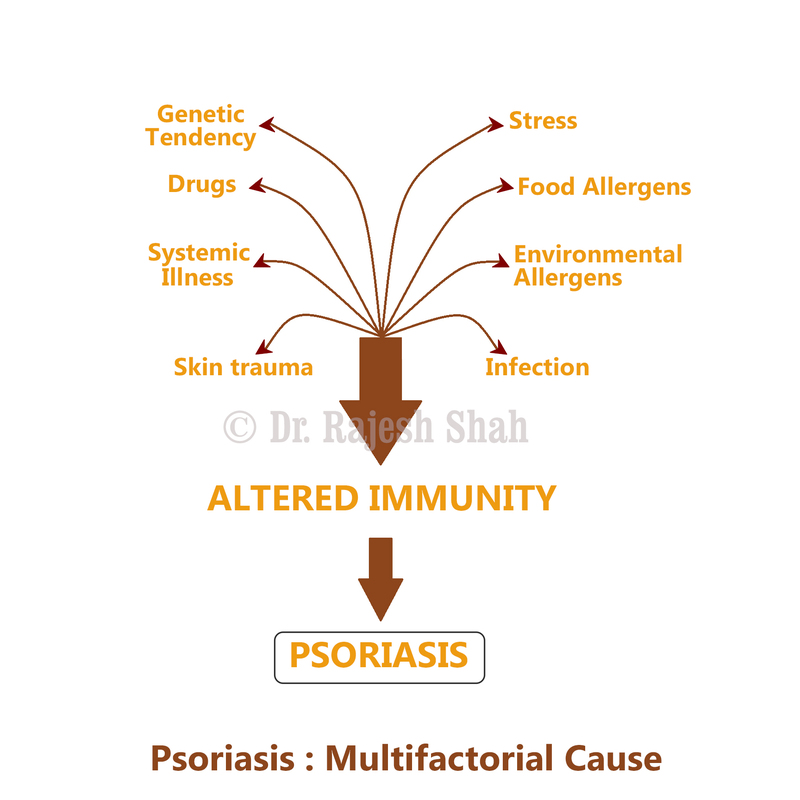 Autoimmunity: The cause which forms the basis of psoriasis is the immune system reacting to the skin cells. In a normal skin, the cells in our body renew itself daily without any visible shedding of the skin. But in case of psoriasis the skin cells multiply rapidly to such an extent where you can see the scales falling of which is the dead skin. This is autoimmunity where the cells of the body do not recognise their friends and start fighting with each other. 2. Hereditary: The genetic cause is also known to be the major cause of psoriasis. One may have the tendency to have psoriasis if anyone in the immediate family is suffering from psoriasis or any other autoimmune disease unlike psoriasis. Having a parent with psoriasis increases your risk of having it. If both the parents have psoriasis the risk is even more. 3. Medications: Frequent intake of medicines such as beta blockers (antihypertensive medicine) and NSAIDs (anti-inflammatory drug). 4. Trauma: Injury to the skin also may trigger psoriasis in the affected area, which is called as the Kobner’s phenomenon in the medical term. 5. Stress: Long standing stress may make you prone to have psoriasis. Psoriasis vulgaris: Most common type of psoriasis, which is characterized by scaling and itching. It affects any area of your body. 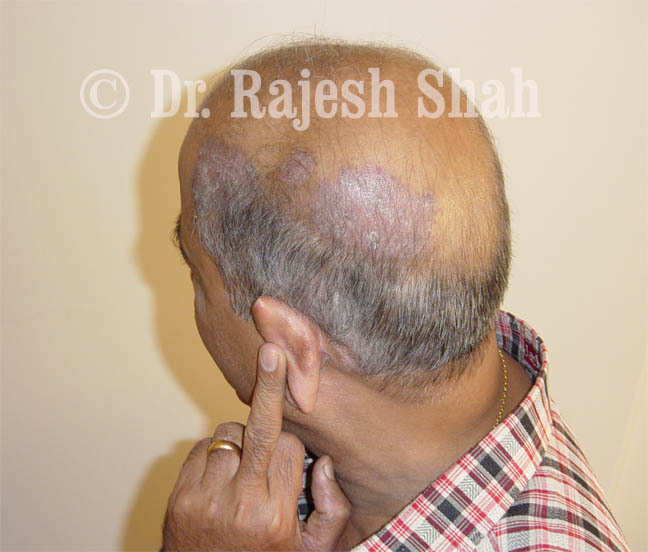 Guttate Psoriasis: It presents with multiple drop shaped lesions. Pustular Psoriasis: It presents with small non-infectious pus filled blisters (boils having clear transparent non-infectious liquid). 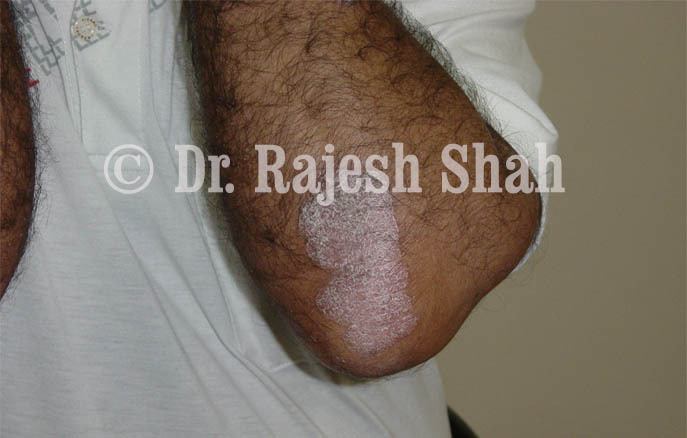 Inverse Psoriasis: This type of psoriasis is mainly found in the folds of the skin like the folds of the elbow, arm pits, under the breast, in the groins (folds of the thighs) and behind the knees. Erythrodermic Psoriasis: This type is least common, but is very serious. It covers most of your body and the patches appeared as if burnt. 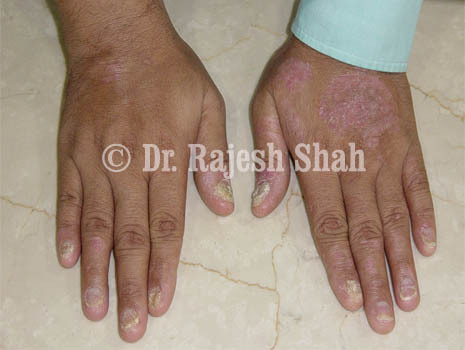 Palmar psoriasis: Lesions are restricted to palms and hands. Plantar psoriasis: Lesions appear in the feet and soles. Palmo plantar psoriasis: Lesions affect the palms, hands, feet and soles. Psoriatic nails: Psoriasis can also affect the toe and finger nails. The nails appear pitted, yellow in colour. They are usually brittle and break easily. The nails are lifted up from the nail bed and there is a powdery deposit beneath the nails. Psoriatic arthritis: Psoriasis tends to affect any joint in the body. It denotes an advanced stage of psoriasis and is more challenging to treat as compared to skin psoriasis. It is seen that about 15% of the people having psoriasis have joint inflammation. It commonly affects the fingers joints and small joints like wrist, elbow and ankle joints. At times it becomes difficult to differentiate between other similar looking conditions like rheumatoid arthritis, gout, osteoarthritis etc. But when it comes to psoriatic arthritis, the patient is usually suffering from psoriasis which is enough to confirm the diagnosis. There is marked swelling of the affected joint, with pain which may vary in intensity and frequency. There may be stiffness in the joint which is usually worse during morning and winter season. The blood investigations may misguide you at times since the C reactive protein and ESR may be raised. But the RA test is negative, anti CCP antibodies and antinuclear antibodies are normal which helps in ruling out other conditions. Homeopathy is the first line of treatment for psoriasis. Psoriasis is not a superficial disease of the skin; it is as a result of the faulty immune system which needs to be corrected. There are certain genetic predispositions which make one prone to have psoriasis. The disease is deep seated and hence calls for a systematic treatment and well planned deep acting medicines. Homeopathy has the potential to stimulate body’s natural healing capacity and restores the disturbed immune system. Homeopathic medicines work and address at the root cause of the disease and restores the deviated immunity back to normal. Talking about the time taken for psoriasis recovery, the length of the treatment time varies from case to case. One should definitely think of homeopathy when psoriasis is recently detected and the patches are mild in nature. Start homeopathic treatment immediately in order to lessen the treatment time and prevent further complications of the disease. Some types of psoriasis where the nails, scalp and joints are involved take much more time than others varieties of psoriasis. In cases of extensive psoriasis, lesions take much longer time than mild cases. The history of medication is also important during the case taking procedure. At Life Force, meticulous details are noted while taking the case history of the patient, which gives a brief idea about the complexity of the disease. The longer you take the steroids or any other immune suppressants; the treatment time lengthens as the disease becomes more complex. The general health of the patient also plays a major role in determining the recovery of psoriasis. Underlying autoimmune disease like thyroid diseases, diabetes or systemic illnesses like hypertension may also affect recovery time. A significant recovery can be expected in initial 8 to 10 weeks of treatment. It treats psoriasis by giving certain immune modulating medicines like steroids, methotrexate, cyclophosphamide and cyclosporines. One of the commonly prescribed cyclosporine is the tablet Psorid. The steroids are usually given in an ointment form in the initial phase of the treatment when the psoriasis is mild and not very extensive. In extensive cases of psoriasis steroids are given in the form of tablets which gives a quick relief from scaling, itching and reduces the active lesions. But unfortunately, after stopping the steroids ointment or tablets, it increases the psoriatic lesions in even more intensity than before. This is called as the steroid withdrawal effect. Similarly the other immune suppressants also have similar role to play unlike steroids. These drugs start showing side effects on various internal organs and general health if continued for a long time. Diet is an inevitable part of the psoriasis treatment. Go gluten free, yes we at Life Force recommend patients suffering from psoriasis to be on a gluten free diet. Gluten is a complex protein found in wheat, barley, rye and majorly in refined flour. Foods rich in gluten are known to trigger itching and scaling. In a small survey at Life Force, we saw that patients who were on gluten free diet responded very well compared to those who were taking gluten. Their symptoms were eased out in a short span of time compared to those eating gluten. So avoid eating wheat, bakery products and substitute it with nachni, bajra, jowar, maize, buckwheat (kuttu)and rice flour.